The ponies of Ponyakademie are a mixed group. We have everything from a Lewitzerpony, a Haflinger-Cross-Breed to a Tinker. Because of their height they are suitable for children, teenagers and grown-ups, at the same time they offer good rideability and willingness to work. The horses are kept in large pens in groups of two or more. When the weather is fine they spend every morning and their days off on the pasture. Therefore, they are always well-balanced and highly motivated to work. We only use high quality equipment. Every horse has its own fitted saddle, which is suitable for children, as well as its own cleaning utensils. The hoofs are looked after regularly and quarterly checked by a vet or a physiotherapist. 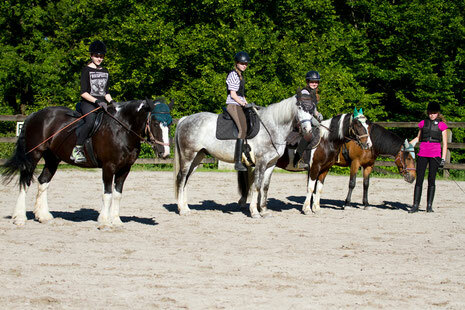 The good schooling of the ponies is preserved by regular weekly training through the horse riding instructors.